If you don’t subscribe to my newsletter, I wanted to share my latest email that went out today. Figured you might be interested in what kind of things I send out to my newsletter subscribers. If you’re interested in subscribing, click here or sign up on the left of this page. If you already subscribe, thanks! I know this is my food blog and all and I am the Sweet Pea Chef, but so much of our home kitchen and my foundation as a cook comes from Dustin. Like with grilling. I’m not sure if I’ve mentioned it already, but Dustin is a fantastic griller. This means good things for me because I am not such a grilling aficionado. In fact, I much prefer to leave all the grilling to Dustin. And, why not? He spends a lot of time and energy researching all the best ways to grill and he makes amazing burgers, tri tip, salmon, steak, chicken and more. The good news for me? He cooks delicious food on the grill. And I get to eat it. The good news for all of us? He is willing to share all his secrets and provide us step by step instructions on how to grill amazingly flavorful food. 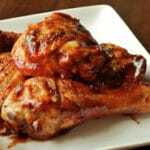 As our inaugural “How To Grill” post, we decided to start with Dustin’s tips on grilling chicken thighs and drumsticks, though these tips also will work for most any cut pieces of chicken, like wings and chicken breasts. Let’s get grilling! 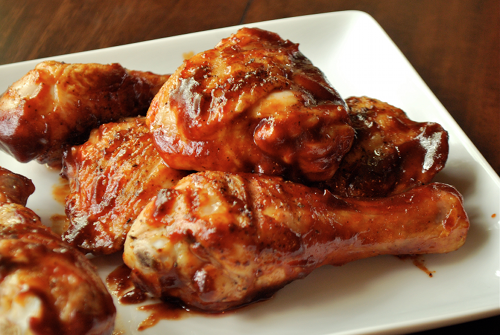 What you’ll need: Good quality chicken (separated into thighs, drumsticks, breasts, etc. ), a gas or charcoal grill (ideally with the ability to set and read temperature), a meat thermometer, salt and pepper (BBQ sauce is optional). Leave the skin on the chicken for added flavor and juiciness. Even if you don’t like to eat it, you can always take it off after grilling. Make it simple and just sprinkle a healthy serving of salt and pepper on the raw chicken before placing on the grill. Preheat your grill before adding the chicken — have two areas on your grill – one for high, direct heat and one for lower heat. You will first place the chicken directly above the high heat to sear, then move it to the lower heat. Use tongs (like the ones pictured) rather than a spatula for better control when flipping the chicken. Place the chicken over the high heat for approximately 5-8 minutes or until well-browned and crispy. The longer you leave it there, the crispier it will get. Once seared, flip the chicken and place over the area of lower heat. Close the cover to the grill at this point and leave the chicken, untouched, until the internal temperature reaches at least 165 degrees, approximately 5-10 minutes, depending on your grill. If desired, you can spread on your BBQ sauce at this time. Either use a brush or add some sauce to a deep dish and roll the chicken around to cover. If removing the chicken to add sauce, place back onto the grill for a minute or so. How to Grill Chicken - Learn all of Dustin's tips on how to grill amazing chicken with step by step directions. Leave the skin on the chicken for added flavor and juiciness. Even if you don't like to eat it, you can always take it off after grilling. Preheat your grill before adding the chicken -- have two areas on your grill - one for high, direct heat and one for lower heat. You will first place the chicken directly above the high heat to sear, then move it to the lower heat. What does high heat and low heat mean? What temps? Grilled chicken in 10-18 minutes? I don’t believe it. Bone in breast halves will take 17 min, legs and thighs 30-35 min.